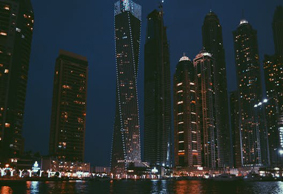 It is a vibrant city in the United Arab Emirates known for luxury shopping, ultramodern architecture, beaches, a lively nightlife scene and glorious sunshine. In 2020 Dubai will host Expo. For this event 12 huge building projects are to be completed including new Islands, new canal and new city areas with Art Galleries and Concert Halls. Dubai has been called the “shopping capital “of the Middle East and has more than 70 shopping centres, including the world’s largest shopping centre “The Dubai Mall” .Dubai is also known for the traditional Souk District located on either side of its creek. Traditionally, Dhows from East Asia would bring their cargo to sell in the souks adjacent to the Dubai Creek which is a UNESCO World Heritage Site. 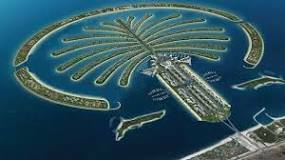 The Palm is an artificial Island in the shape of a Palm Tree with its trunk, the main road coming from Jumeriah Beach. The” branches” haves many residential houses, hotels, beaches and The Atlantis marine-animal park. Dubai airport is very over the top with tall glistening pillars with high ceilings and chrome reflections. In the entrance is a vast waterfall cascading down one wall. It is an interesting 40 minute drive from the airport to the Jumeriah hotels and Marina with high rise buildings and beautiful hotels. 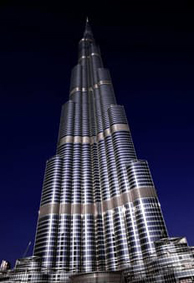 You drive past the new Burj Khalifa the tallest building in the world which houses the Armani Hotel and then along the seafront past the famous Burj Al Arab which looks like a sail and the Jumerah Beach hotel built to look like a giant wave. Dubai is a very safe destination with low crime rates. Dubai is approximately 7 hours flight time plus 4 GMT. 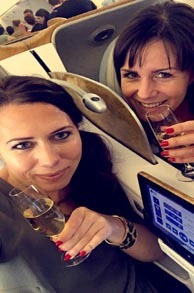 Emirates have three daily from Birmingham .Business Class is certainly the way to travel with excellent service and food. There is a Hopper City Bus which takes about 4 hours. It stops at the Atlantis and Madinat hotels plus all the main shopping malls, The Creek, The Souks and all the main areas. Tours are available for the Gold Souk, which has an amazing variety and selection of jewellery. The Spice Souk is fascinating with sensational aromas .Sail on a Dhow on The Creek during the day or have your evening meal. It is very easy to get a taxi to these places. The metro is very easy and takes you again to the main places but you have to change Metros to go on the “Palm “.There are women only carriages so check it out if travelling with a man . There is a tram service also to make your journeys to the city easy but Taxis are very reasonable. Burj Khalifa, an 830m-tall tower, dominates the skyscraper-filled skyline with amazing views and incredible facts about the construction of the building .The peak time to visit is from 17.00 to dusk so would advise you to pre-book . At its foot lies Dubai Fountain, where the jets of water light up, choreographed to music. The display is every 30 mins from 18.00. 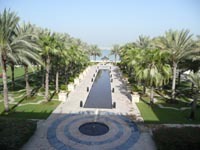 The Madinat Hotels has an area with a souks and nightlife. 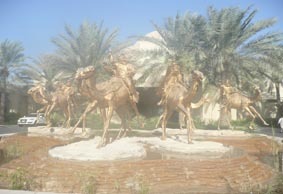 You can ride on a water way all along from Al Qasr hotel to other hotels. “Ski Dubai “is the world’s largest indoor snow park and is situated at the” Mall of the Emirate “offering snowboarding, ski lessons, a children’s play area and a cafe. The main shopping centres are “Mall of the Emirates “and “Dubai Mall “. There are two main Water Parks are Wild Wadi Water Park and Atlantis Water Park. 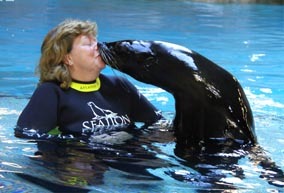 At Atlantis you can swim with Dolphins and Sea-lions but has to be booked. You take a Helicopter Ride, Air Balloon or Sky Dive from Dubai Marina. The 7 star hotel, Burj Al Arab can only be accessed if you make a reservation to have brunch, lunch, afternoon tea, cocktails and dinner. Cocktails in the ……. The new “Dubai Parks and Resorts” consists of 3 Themed Parks, LegoLand and Water Park, MotionGate a Hollywood themed park including Dream Works and Bollywood Park .Riverland is a new area near the parks which has various themed areas with hotels and restaurants . 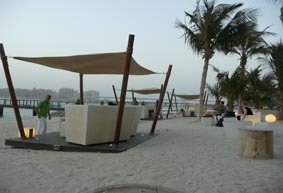 In the evening you can walk around the Marina or along the JBR road but there are only dry bars. This hotel is a very high standard for both business trips and holidays. There are two towers with many restaurants and bars. “Indego By Vineet ” is a delicious Michelin award Indian Restaurant .”Slones” is a buffet Restaurant with an amazing Seafood Buffet on a Thursday. “Toro Toro ” is a truly outstanding Restaurant. 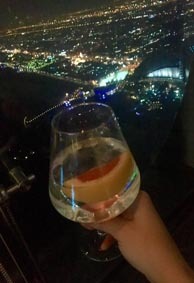 “Bar 44 ” has unusual cocktails with marvellous views over the city and marina. 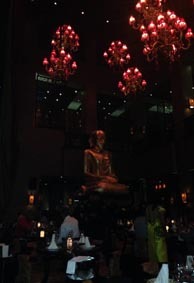 “Buddha Bar” is very popular with expats and you can eat or just drink .It has a great buzz. There are 2 Spas and Pools which are very luxurious but the pools do not have all day sunshine due to the high rise buildings around them. 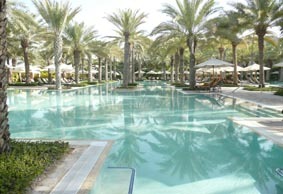 You can use the pools and beach at Le Royal Meridian with a free 2 minute shuttle service. You can sign to your room for food and drink at this hotel. I would advise when booking your holiday you upgrade to include access to the Lounge called “Level 5 “. This is a private lounge that serves breakfast, free lunch, snacks and free drinks and canapés from 6 pm to 8 pm. Vicki and Jane have both stayed here. 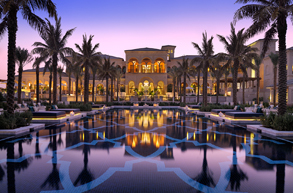 A Stunning Hotel resembling an Arabian Village consisting of 3 luxury properties set within beautiful gardens and meandering waterways with their traditional water taxis (Abras) connecting you between all 3 of the hotels and the huge selection of 44 restaurants and bars. 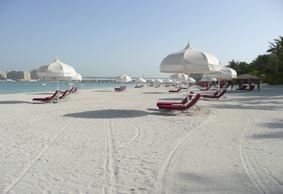 The stunning private beach overlooks the famous Burj Al Arab, with sunbeds and parasols set out, each with a button to call for service when you require a drink or snack! The rooms at all 3 properties Mina A Salam, Al Qasar and the Dar Al Masyaf are all very different but all have the same luxury Arabian style. My favourite is the Dar Al Masyaf – These are beautiful Summer Houses with the decor of Old Arabia. The ground floor rooms have a terrace which opens out onto a small garden area, where as the 1st floor rooms have a large balcony with views onto the waterways where you can sit and watch the passing Abras. Each cluster of Summer Houses have a shared central courtyard where pre-dinner drinks and canapes are served early evening. This really is traditional luxury Arabia. 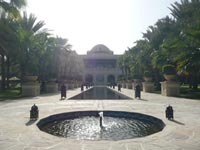 There are 3 hotels within this complex The Palace, The Arabian Court and the Residence. 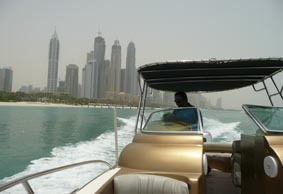 The One and Only on The Palm Island can be accessed by a private hotel speed boat that leaves every 30 minutes. The hotels are set amongst 60 acres of manicured gardens with four swimming pools including two at The Palace, and one at the others. I liked the “Palaces “large pool area with very comfy sun beds. 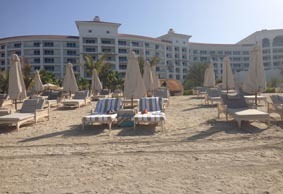 They all have Cabanas and plenty of Palm Trees for shade. The beach is big with white sand and lots of sun beds but the sea can be uncomfortably warm in the summer months. I have been when it has been 40 degrees plus but did not find it unbearable as it is not humid. The staff are very attentive with “freebies” including fruit, sunglass cleaning and ice water. On arrival you are seated while you check in and are given complimentary hot beverages with cakes and croissants. With the half board option you can eat at all the restaurants free if you have the Table D’Hote Menu but if you order anything from Al a Carte you have a set amount to contribute to the cost, which usually covers the main meal. The restaurants are excellent including “Nina “an outstanding Indian restaurant with beautiful decor, dark with candles, a Moroccan ,”Olives ” an Italian(where we had breakfast), The Beach a seafood restaurant where we ate lobster , the “Rotisserie “a buffet restaurant which had delicious puddings. “Eau Zone” and “Celebrities” a fine dining restaurant with beautiful food again with lots of extras. We met Dave Myers (Hairy Biker) and his wife here. 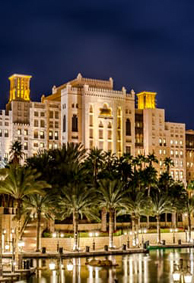 The restaurants at the One and Only Hotel on The Palm give you 10% off your food. 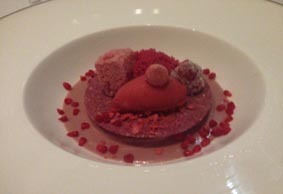 We ate in “Stay” by Yannick Alleno a Michelin starred chef. It specialises in Chocolate. All Hotel bars are good including the roof top terrace which had views over the sea and the high rise area of Dubai Marina, the “Jetty Bar ” is on the beach which is great for sunset cocktails and the “Arabian Courtyard “bar is a great place for people watching and being with the Arabs and the bubble pipes which have different flavours. This is one of the long standing Hotels in a prime position on Jumeirah Beach. I would say it has one of the best beach locations aside from the Madinat group of Hotel’s further along the beach by the 7* Burj Al Arab. The Meridien has rated very highly on Trip Advisor for many years, this being partly down to the consistent high level of service, huge choice of restaurants and fabulous location. Unlike many Dubai hotels you can walk out from the Hotel to a number of cafes, shops and eateries along the Jumeirah Beach Walk (JBR). The Hotel has recently undergone a complete refurb, all public areas are now complete and 2 of the hotels accommodation buildings are finished, the only building left for refurb is the Tower, which is the most prestige. Saving the best till last I think!! All the completed rooms are now up to the same high standard as all the other 5* Hotels in Dubai, but the Royal Meridien has always been a firm favourite with myself and many repeat clients. Grosvenor House (Listed above) is Sister property to the Meridien, which means you have the added benefit of being able to use all the restaurants/ bars and facilities and sign for any F&B back to your room at the Meridien. The Hotel offers a complimentary shuttle service backwards and forwards to Grosvenor House, albeit it is only minutes away but the main Sheikh Zayed Road passes between the 2 hotels. Located next door to Atlantis, is a low rise hotel with spacious rooms and bathrooms. The hotel has a smaller selection of restaurants than some of the other hotels but very nice all the same. The high standard you expect from the French Sofitel group. 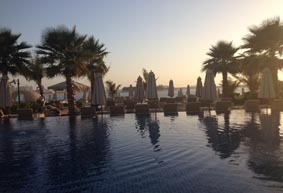 I enjoyed the lovely outdoor pool area and a great pool bar/restaurant overlooking the beach. This is a great choice for families because they have a choice of large apartments/suites with separate bedrooms and good size kitchen area with the added benefit of cooking facilities. 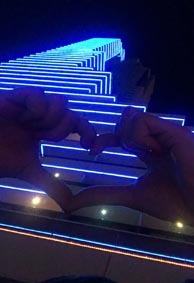 A fabulous choice of Hotel if you want to be situated in Downtown Dubai overlooking the Fountains and the Burj Khalifa, the World’s Tallest Building. 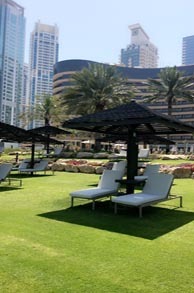 Luxury rooms, some with Fountain/Burj view and a great choice of Bars and restaurants with outside seating areas. This is a real buzzing Hotel as many people just come for a drink and take in the lively atmosphere. This is a great choice if you are in Dubai for a stop over and aren’t looking to stay down on the beach. Downtown Dubai is closer to the Airport if you are only staying for a few days. We arrived at this luxurious hotel in the morning along with Brendan Cole from Strictly Come Dining and his family. The rooms were large with beautiful beds, linen and settee area .You could either have a pool view or a sea view looking over towards the Burj Al Arab. The room had a glass panel between the bathroom and room with blind if required which was unusual and very open. The hotel was elegantly decorated but sparsely furnished. There was a buffet Restaurant with a massive selection and extremely helpful staff. The Southern Asia Restaurant called Lao, a Pool Restaurant with excellent food and a 3 Michelin star Restaurant called “Social”. This Restaurant is outstanding and we dined there several times. The staff and food were unbelievable, a must when staying at the hotel. The evening bars again were friendly but very quiet so you might want to get a taxi to go out.